Split Second combines two of my favorite racing games: Burnout and Mario Kart. If you had told me that and nothing else, I would probably buy the game with no questions asked. Before the demo came out (which is up on Xbox Live and Playstation Network now) I played it at PAXEast, which is a videogame convention that was in Boston about a month ago. I walked up the booth and waited in a rather long line just to play one race. But I did not regret it at all. Split Second is fun in its purist form. It is a Michael Bay movie at its best. You might be thinking that is the stupidest idea you have ever heard, well let me try to change your mind. What is horrible about Michael Bay movies? They have terrible acting and they have awful plot lines. What is the only good thing about Michael Bay movies? They have awesome special effects. That is about it. Split Second is a racing game with awesome special effects. Bridges are falling down, buildings are collapsing, and cars are exploding in every direction. What makes this so engaging is that you control these events. A meter is at the bottom of your car builds up as you drift around corners and draft behind cars. As it fills up you can trigger events that will cause explosions or deformation to the track often creating alternate routes. Boxes appear over cars you are racing against to show when you can perform these set pieces. If you triggered a smaller event, a helicopter may drop an explosive barrel on the car or a semi truck might drive though the intersection taking out a car. When your meter is full, a red box will sometimes appear over a car. These are the jaw dropping events. A plane might crash onto the freeway that you are driving on. A building might tumble down onto the cars in front of you. Both of these things happened in the demo I played which means that these are just the events that happen on just one of the tracks in this game. In the demo for Xbox 360 and Playstation 3, things are already improved. The cars seem faster, the explosions are more vibrant and the controls seem tighter. This generation, there has not been an amazing classic arcade racer. 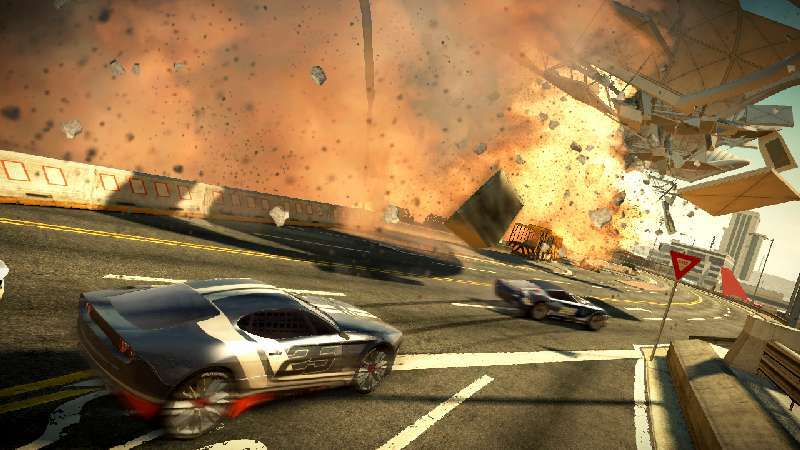 Burnout Paradise was great, but the open world elements left me wanting well designed tracks in their place. This looks to be the game that I have been waiting for and with its simple controls and action packed gameplay, I think other will love it too.